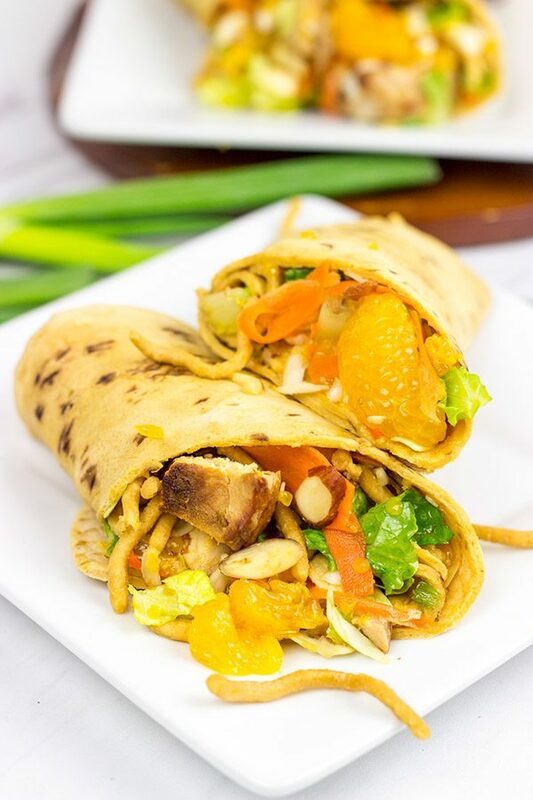 With just a little prep work on Sunday, these Mandarin Chicken Salad Wraps will turn into some tasty weekday lunches! I remember the first time I made these wraps. It was a couple of months ago, and we were hunkered down in the midst of a blizzard. Laura was working from home, and Robbie’s daycare was closed for the day. I spent part of the morning shoveling snow, and I was really feeling something fun for lunch that day. Since the whole crew was at home, I asked Laura to help me come up with a fun idea. She suggested an Asian chicken wrap, and I remembered that we had some canned mandarin oranges in Robbie’s stash of fruit. I figured Robbie wouldn’t mind (or even know) if we borrowed his fruit for our wraps! I marinated a couple of chicken breasts for about 30 minutes and then cooked ’em up in a cast iron skillet. Meanwhile, I whisked together an easy sesame dressing and mixed up the filling (including Robbie’s mandarin oranges!) in a large bowl. Once the chicken was done, we stirred it all together and rolled it into wrap form. Lunch done! Sure, this lunch took a little longer to make than a normal weekday lunch…but it was a snow day! 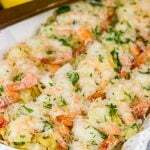 Plus, this recipe makes a decent amount, so we had easy lunches for the rest of the week. (We did store the filling and the dressing separately so that the cabbage/lettuce wouldn’t get soggy. We just filled a wrap up each morning before work.) Oh, and did you catch the ‘first time I made these wraps’ earlier? That’s because I’ve now made these wraps 3 times…in 3 months. They’re that tasty! I’ve tweaked the recipe a bit over time (like adding the chow mein noodles), but the base recipe is the same. 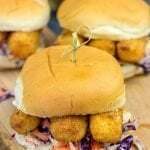 Just remember…weekday lunches don’t have to be boring! Whip up something fun on the weekend, and then roll it into a wrap. I promise your coworkers will be jealous when they look over and see your Mandarin Chicken Salad Wraps. Enjoy! Whisk together the marinade ingredients. Place chicken in a shallow glass baking dish; pour marinade on top. Let chicken marinate for 15-20 minutes. Meanwhile, place large skillet or grill pan over medium-high heat. Remove chicken from marinade and place into hot skillet; discard any remaining marinade. Cook for 8-10 minutes, flipping halfway through, or until chicken is fully cooked. Let chicken rest for 5 minutes and then slice into strips. Using a medium bowl (or a jar with a tight-fitting lid), add all ingredients; whisk together until well combined. Store any leftover dressing in an air-tight container in the refrigerator for up to 2 weeks. Before using, shake well to recombine. Divide the mixture evenly between the wraps. 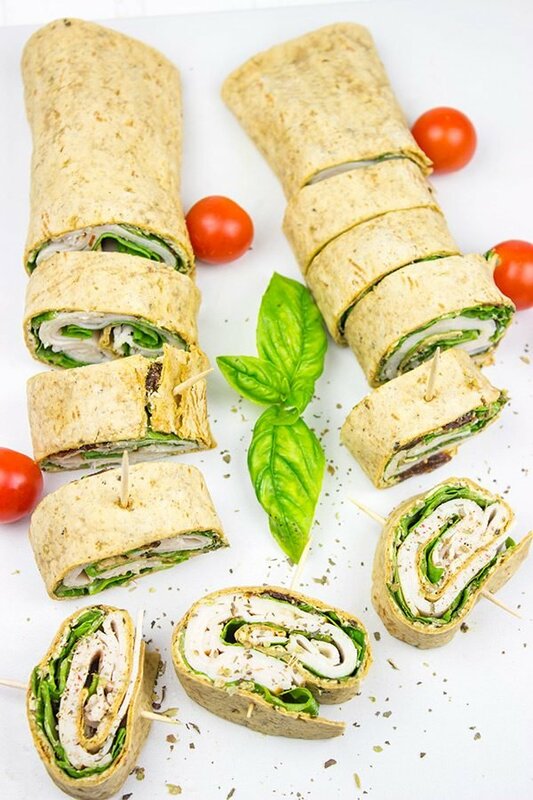 Roll up flatbreads; cut in half before serving. Disclosure: This Mandarin Chicken Salad Wraps post was sponsored by Flatout Flatbread, but the recipe and opinions are entirely my own. Thank you for supporting the brands that support Spiced! I’m totally on board with all the great flavors you’ve wrapped into these wraps! And so glad to say goodbye to snow shovelling for another year! Oh yeah! I am definitely happy about putting that snow shovel away until next year…in fact, I’d be happy to put that thing away permanently! Thanks, Jeff! Hahahaha! Robbie is nobody’s fool! I’d take back all my mandarin oranges too :). Those little wedges of heaven add so much flavor to everything. But tell him thank you for the loan so we could all see this awesome recipe. I usually just have yogurt for lunch but I aspire to eat real food someday. . .this is a great place to start. Have a great Thursday, David! Yes! Those canned mandarin oranges are now a staple in our pantry thanks to Robbie. He loves them! So I decided to steal (ahem, borrow apparently) some of them to make these wraps. So yummy! 🙂 And, yes, Robbie is very keen on what I’m up to these days…and he let’s me know if he doesn’t approve. Hah! Thanks, Dawn! These wraps look fantastic!! 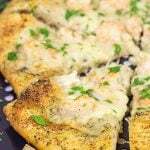 I just tried Flatout flatbreads for the first time recently and was impressed. I love the addition of chow mein noodles in these – I bet they a great crunch! Why thank you very much, Mara! 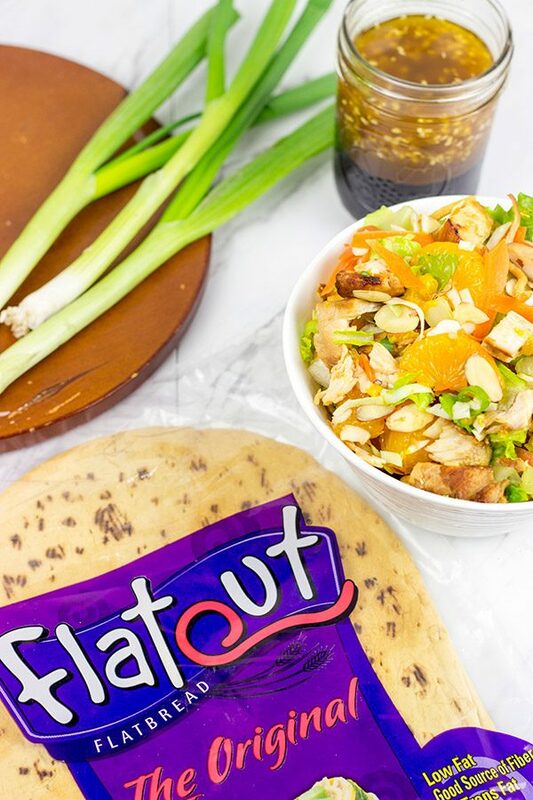 We seriously do love Flatout flatbreads around here. 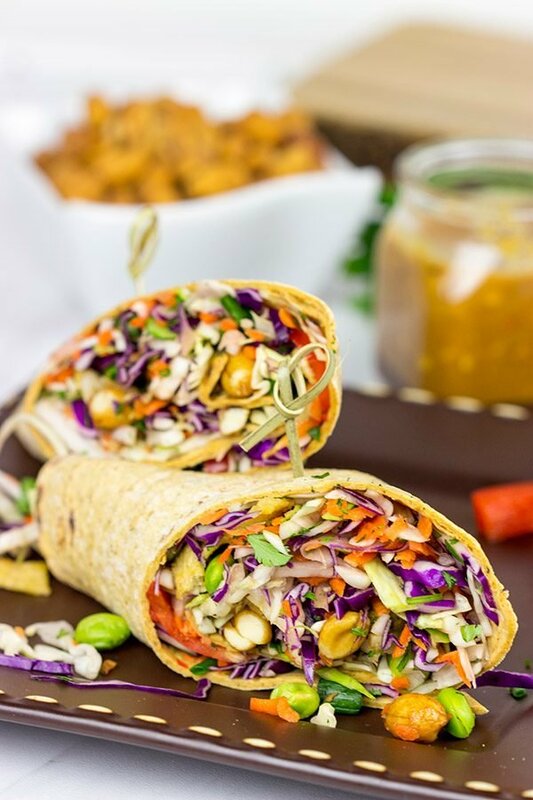 We’re always making wraps for lunch or dinner! This time I “borrowed” some of Robbie’s mandarins, and they made for a fun addition. And, yes, the chow mein noodles bring a nice crunch, although you can’t add those in advance since they lose their crunch. Hope you had a great weekend, my Michigan friend! These wraps would really jazz up my usual boring lunches. I love all of the ingredients in this wrap. 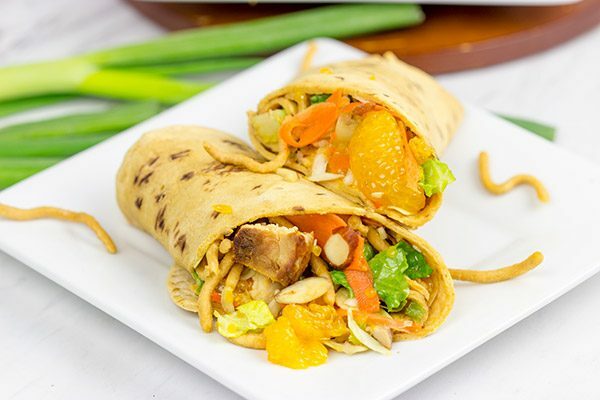 The mandarin oranges sound great in these wraps, I am sure Robbie didn’t mind sharing. Well, Robbie might have gone in and stolen all of his mandarins back from this wrap filling. Haha! But these wraps are indeed a fun way to mix up weekday lunches. Plus, you can make the filling ahead of time, so lunches are nice and easy for the week! Thanks so much, Dawn! Seriously? You hate wraps?? What did wraps ever do to you?? Haha! You could totally deconstruct this one and eat it in non-wrap form. Robbie didn’t mind too much that I stole his mandarins…well, that’s not true. He went and stole all of his mandarins back from the bowl after I shot these photos. Haha! Thanks, Mary! Hope you had a great weekend, my friend! Store flatbread wraps in the freezer. How simple is that? I’ve seriously never thought of that. David you’re a genius! You can’t get anything else into my freezer but wraps being flat, you sure could! And I love the flavours you’ve got going on here. Mandarin oranges too? Brilliant. 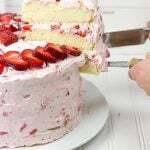 My mouth is currently imagining all those sweet flavours mingling. 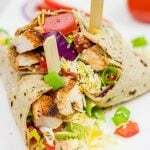 These wraps are super simple to make, and they are quite tasty! The mandarin oranges provide a fun, sweet addition…even though Robbie went through and took all of his mandarins back afterwards. Haha! I hope you guys had a great weekend, my friend! 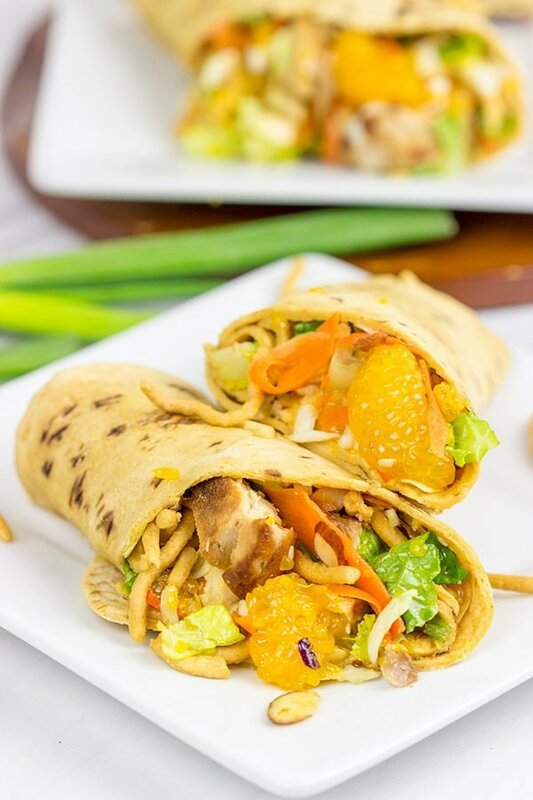 Mandarin chicken salad is one of my favorites, but putting into a wrap just takes it to a whole new level! These look fabulous! 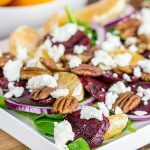 It really is an easy wrap filling to mix up, and it makes for great weekday lunches! The wrap form just makes it much easier to pack and eat. 🙂 Thanks, Kathy! I hope you had a great Mother’s Day weekend, my friend! On a serious note though – you come up with some fantastic wrap ideas! 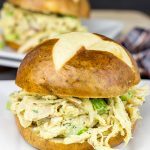 This is just too fun – loving all the flavors and good tip regarding storing the filling and the dressing separately – I cannot tell you how many times I’ve forgotten that step and ended up with a soggy mess the next day! Thank you so much for the kind words about the wraps. These are super easy and super tasty. And Robbie’s mandarins added a nice little sweetness…at least until he went through and stole them all back! 🙂 Thanks, my friend, and I hope you had an awesome Mother’s Day weekend!! 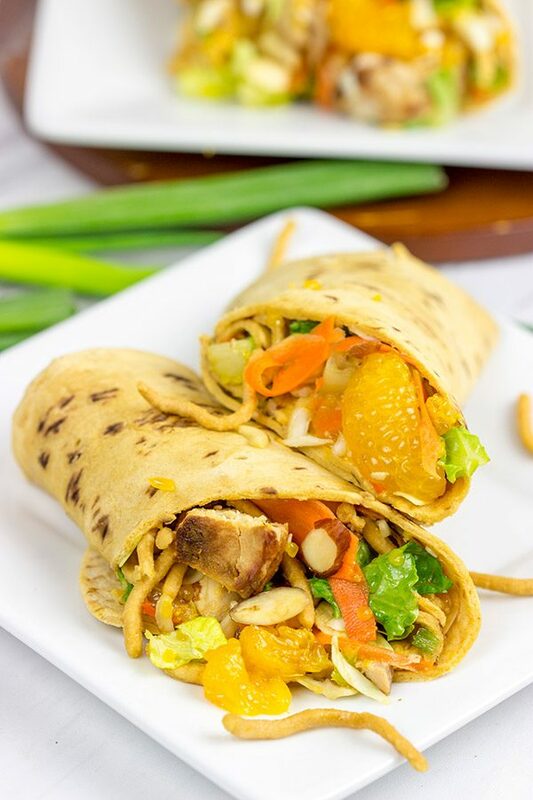 I haven’t had a mandarin chicken salad in ages and now it gets the wrap touch. Nicely done! Oh, it’s so much fun in wrap form! It’s easy to mix up the filling ahead of time, too…so you’ve got delicious lunches all week long. Thanks, Kevin! These chicken wraps look so appetizing! Why thank you so much, Pamela! The mandarins in here add a fun little sweet touch. 🙂 I hope you had a great weekend, my friend! This is a great idea of a picnic lunch for the summer! Oooo…you’re totally right, Bethany! These would be great for a summer picnic. I’ll have to make another batch soon…and hope that little Robbie doesn’t steal all of his mandarins back again! 🙂 Thanks so much for stopping by and commenting!